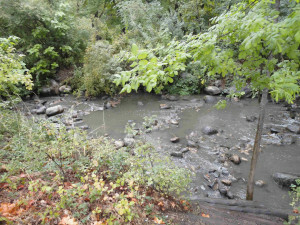 When you live next to a river or creek, you know how special that is. However, it’s more than just a pretty spot; your property is part of a larger ecosystem of plants, animals, land, and water that make up riparian zones. Rivers and streams rely on riparian zones as buffers to absorb floodwaters, filter pollutants from runoff, provide critical shade to cool waters, provide wildlife habitat, and other benefits. However, as more land is developed, we are losing these protective areas and all of their benefits. When riparian areas are lost, more pollution reaches rivers and streams, habitat is diminished, and water temperature increases. These are big problems for salmon (who love cold water), people, and other species. That’s why balancing your needs with the needs of the larger ecosystem is what streamside landscaping is all about, and a key to becoming Stream Smart! For the best natural fertilizer, amend your garden soil, or top dress your lawn with nutrient–rich compost, or compost tea. Our Stream Smart Composting makes sense page provides all details on using compost. Right plant, right place! 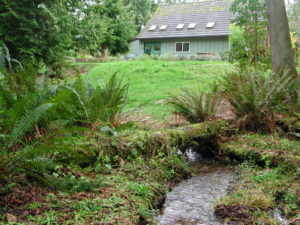 Choose appropriate native plants and trees that can survive along streams. Plant shade helps to keep streams cool. Our Stream Smart Go Native or Urban Trees pages provide resources for selecting appropriate species. For the easiest landscape to care for, replace ornamentals and lawns with a “xeriscape” or “water-wise” garden. They take much less work and water, and require no pesticides or fertilizers. Our Stream Smart Watering to protect streams page provides guidance. If you have livestock, consider fencing animals to keep them out of the water. Visit our Stream Smart Agriculture page for more information.